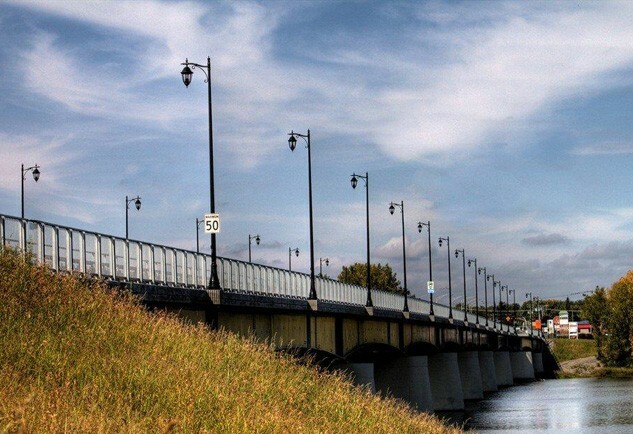 Originally built between 1947 and 1948, the Arthur Sauvé Bridge allows route 148 to cross over the Mille Iles River, joining Saint-Eustache and Laval. The bridge was opened to traffic on December 21rst 1948. Filthy years later, 24 000 vehicles are crossing this bridge daily. It is under the jurisdiction of the Ministry of Transportation of Quebec. The bridge, closed to overloaded vehicles, was subject of minor repairs in 2005. It has now reached the end of its useful life. The ministry of Transportation of Quebec has recommended its reconstruction for 2008. Plans and technical specifications were elaborated in 2007 and work will be performed between 2008 and 2010. Re-construction will occur in 3 different phases: pillars will be enlarged and the bridge abutments will be rebuilt. A portion of the deck will also be widening to allow the layout of a multipurpose track. The existing bridge deck will be rebuilt and during summer 2010 the protection railings and final layer of pavement will be done. 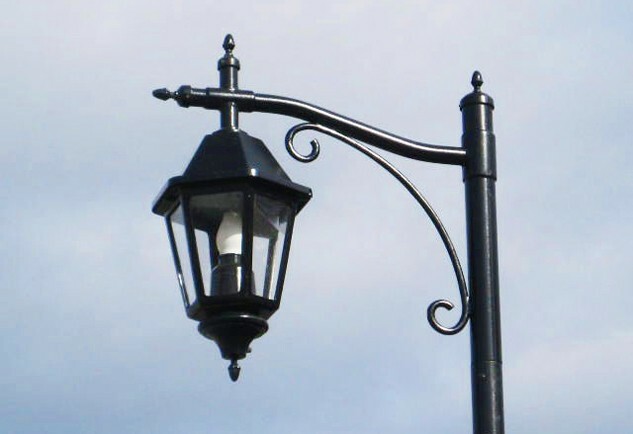 The municipalities of Laval and Saint-Eustache have agreed to replace the existing conventional lighting by a functional decorative luminaire offering an enhanced architectural aspect. The intent is to create a distinctive signature with the lighting system taking advantage of the functionality and the look, two features that will improve safety to the bridge users. The antique look of the PRO650S luminaire from Quattro, a strongly shaped hexagonal lantern, couple to the slenderness of the fluted pole makes us realize that yesterday and tomorrow are not so far. Like the Arthur Sauvé Bridge the luminaire integrates this element of cohesion between the simplicity of the past and the modernity of the new technologies. The Huntington style aluminum pole with its cast decorative base and the scrolled console gives the assembly a nostalgic touch blending it harmoniously with its environment. Integrating an element of the past, this luminaire will shine a contemporary light, with renewed power well adapted to the vocation of the bridge. 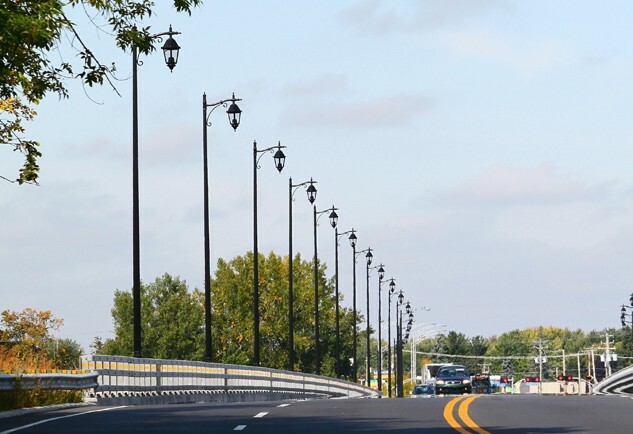 The main purpose of roadway lighting is to achieve a level of lighting that will assists the motorists and pedestrians in distinguishing with certainty roadway details such as raised curbs, horizontal bends and obstacles. The Ministry of Transportations of Quebec required that the lighting design meet recognized national and international practices in street lighting, namely the ANSI-/IESNA RP-8-00 Roadway lighting handbook and the CTA design guide. To achieve this ambitious task and meet the required illumination levels with economically reasonable and safe pole spacing, Quattro proposed to incorporate into its PRO650S, a cut off optical system composed of its hydro formed OCB reflector with a type III distribution. Using a 150W HPS horizontal lamp, this system offers superior photometric performances. Not just minimizing the light pollution as defined by the Dark Sky association, this optical system offers a better visual comfort, and a reduction of the spill and dazzling that can cause accidents. Quattro then proposed to install 34 staggered luminaires spaced 38 meters to cover the bridge span which is 625 meters long by 18.8 meters wide. Two decorative luminaires where added on the Saint-Eustache approach. Structural calculations were also performed to confirm that the poles were capable of withstanding the wind and ice loads as defined by the Ministry standards. Also, the luminaries had to conform to the MTQ standard no.8301 art. 3.5. regulating vibration test. Therefore the PRO650S was tested against impact and vibration in accordance to the PSEL-01 procedure for bridge installation. The objective of the tests is to evaluate the capability of the equipment to sustain solicitations that are likely to occur during its useful life for a standard bridge application. 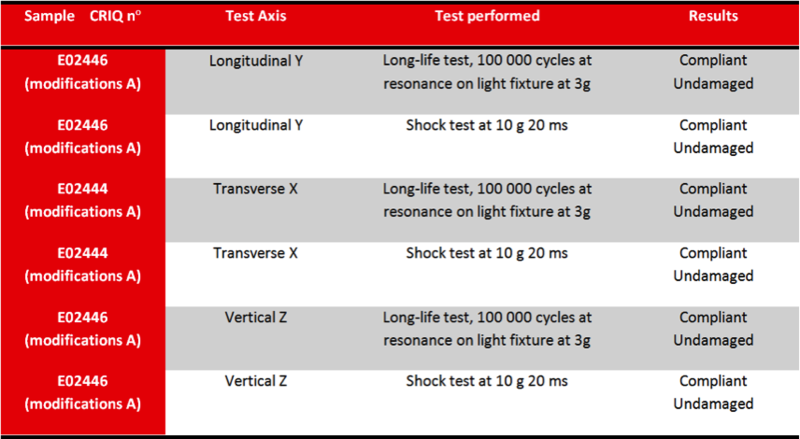 A 100 000 cycles, vibration test was them performed in all axes (x,y,z) at the resonant frequencies of the unit under test. The acceleration for a bridge luminaire is 3.0g. The unit was also tested for impact at 10g for 20 ms in the same tree axis, in both directions (positive, negative). A total of 6 impact tests were performed on each tested units. Following all those tests, the unit has to be in a working condition and under X rays testing not show any crack or damage to the shell or the tenon. All hardware and ancillary components must be in place and show no damage. As well, gaskets, hinges or clips must not show any sign of wear and cracking. Quattro’s PRO650S light fixture passed all the tests in each of the three perpendicular axes therefore demonstrating its compliance with the referenced standard. In conclusion, the luminaire tested, Quattro’s PRO650S in this case,did not show any signs of damage in terms of physical integrity pursuant the endurance test. The luminaire remained intact and the service tray remained adequately closed without any of its parts coming loose. Thanks to judicious planning and smart engineering plus an adequate usage of the pole, bracket and luminaire the lighting design of the bridge will offer a comfortable and safe night environment for motorists and pedestrians. Let’s make thousands of stories together. At Quattro, we believe luminaries are a strategic element of design. They contribute to create the desired look and feel of urban projects and therefore, enhance our environment. Our team takes great pride in making unique, well built pieces that contribute to create enchanting ambiances. You can focus on the idea, we will take care of putting it into practice. We are committed to developing advanced lighting. Our design and implementation team is a key source of information right from the start of your project. So we guarantee you the peace of mind needed to realize outstanding projects. A well-designed project should be timeless, and so should its essential elements. Lighting represents a significant part of the heritage of a great project. At Quattro, we aim to find innovative ways to implement your vision, without compromising on durability, ease of maintenance or lighting performance. We carefully select our materials and finishes, and make our products with care, in order to deliver quality products. Considering the whole life cycle of lighting solutions. Design and manufacture are just the start. Reliability, energy efficiency and total acquisition costs are major parameters in the delivery of responsible projects. our extensive knowledge of the lighting industry will ensure that the right technical decisions are taken, while favoring solutions that are customized, viable and sustainable. Making sure your ideas work well. Making the experience of installation, maintenance and use work smoothly is also a big part of a project’s success. That’s why our team aims at providing you with functional products by finding inventive ideas for a positive experience.